Grande Maison de vacances pour toute la famille !!! Belle et bien aménagées, 2700 sq. Ft. La maison dans un endroit calme à l'extrémité nord de Sunriver. La maison est le plus souvent un niveau de vie sans pièces creuses ou élevées à l'étage principal. La chambre principale est située à l'étage principal ainsi que d'une deuxième chambre. Il ya un certain nombre de fenêtres qui permettent une visibilité à l'extérieur pour vos tout-petits même - les empreintes digitales de bienvenue! L'arrière de la maison donne sur un secteur peu développé commune qui attire la vie sauvage et fournit un sentiment d'intimité même avec d'autres maisons autour. Notre maison peut accueillir 8 à 10 personnes et est un endroit idéal pour les réunions de famille. La grande cuisine offre beaucoup d'espace pour cuisiner ensemble ainsi que les sièges salle à manger de table de 8 à 10 personnes confortablement. Le grand pont a un banc, plus le pont mobilier intégré offrant le confort nécessaire pour se détendre en plein air avec un livre ou visiter avec des amis. Trois des 4 chambres ont la télévision par câble et la quatrième chambre dispose d'une télévision avec un lecteur vidéo. Deux des chambres disposent de lits king, une avec un lit queen et la quatrième chambre a deux ensembles de lits superposés. Nous avons un certain nombre de vélos disponibles. Pendant les mois d'été, lorsque les piscines sont ouvertes, nous fournissons baignade passe. Il ya aussi une table de ping-pong dans le garage. Il ya un bain à remous privé sur le pont et serviettes de plage sont fournis pour les deux tubbing chaud et la piscine. Pour votre confort, nous fournissons également le besoin de produits de papier et de détergent à lessive. Notre objectif est de rendre votre séjour confortable et facile afin que vous puissiez vous concentrer sur la création de souvenirs spéciaux avec votre famille et vos amis. Perfect--wish we could have stayed longer! I am so glad I found this home--it was just as depicted in the write up and more--clean, spacious, great layout for a family, fully stocked with everything from towels to dishes and conveniently located in the resort community. We loved the bikes---we rode all around the resort, and you can access the bike path at the end of the road. You are also ride-able distance from a park, tennis court (usable only in the summer) and grocery store. The kitchen was better stocked than my own--if you want to get creative in the kitchen, you will have anything and everything you need. The layout was great for a group--the kitchen was open to the dining area (with a large dining table), and there is an island bar counter in the kitchen so everyone can keep the cook company. There are many windows/doors in the home, so we had a great view of the snow everywhere in the home. Kathy was the perfect host--she promptly responded to all my inquiries. We recommend visiting Mt. Bachelor for a day and tubing or skiing/snowboarding, and we most recommend participating in the (free!) park ranger-led snow shoe tour. Beautiful house in amazing Sunriver! We had an absolutely wonderful time during our week in Sunriver! The house was perfect-plenty of room for everyone. The kitchen was well stocked (couldn't get over the number of kitchen cabinets) and all of the essentials were available. The owners (I spoke to Kathy) were extremely responsive and answered all of my initial questions. The home instructions were very clear and made our stay relaxing and carefree. There is a great selection of bikes to use and the house is located in a quiet neighborhood. Overall, we had a wonderful time and would love to come back in the future! Great house - simple, clean, good kitchen and laundry room. The floor plan was great for our age group - 9 months to 65. We enjoyed the bikes, ping pong table, hot tub and SHARC passes. We were glad we brought a bike trailer for the young ones and port-a-crib for the baby. At first we thought the house was too far from the village, river and SHARC BUT we found it nice to be away from the crowds and bugs. Thanks for sharing your home. We had such a wonderful time in Sunriver. This home was the perfect size for our family of 7. The home was spotless (seemed like the home had gotten new carpet recently) when we arrived and so well equipped for anything you could want to do. Bikes for all, SHARC passes, ping pong tournament or a soak in the jacuzzi can keep you busy. There were also games, books and puzzles for all ages. I cooked dinner every night and felt just like home. I could have cooked a holiday meal here easy! The area is very quiet and enjoyed watching the deer that visited from the large deck. Would definitely stay here again. Thank you Querin's for sharing your lovely home with us. Thank you so much! 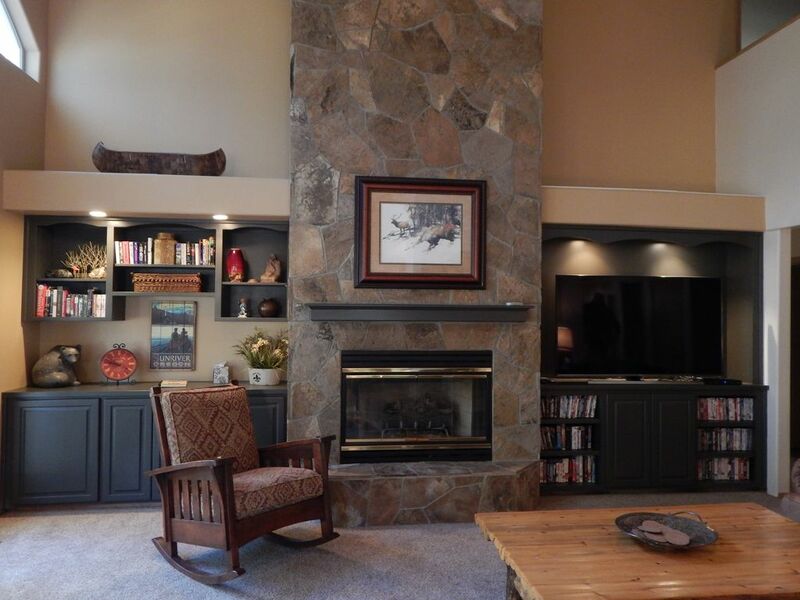 We have so many great memories of times spent with family and friends at our Sunriver home and are happy when guests are also able to relax and enjoy the beauty of central Oregon with their loved ones! Lovely home, we'll appointed and perfect for a fun relaxing vacation! We want to go back right away! We do not allow pets or smoking at our house. Those reserving our home need to be 25 years of age or older.